FRESH AIR After five days, or 134 hours, or 8040 minutes, or 482400 seconds stuck at home : I decided it was time to take a walk and finally got to breath some fresh air. Even tough I don’t really enjoy this beginning of winter ( I always preferred summer : suntans, cocktail dresses, pool parties…), it felt so good to be out. And actually I was pretty lucky, the weather was really chill, not too windy and not too cold. But I took some precautions, and dressed up as well as I could. Therefore my outfit is made of the most comfy knit-sweater I have ever tried in my life. I received it last week and can’t thank enough www.stylebymarina.com for this gorgeous gift that you might have already seen in my last week’s goodies post. You should definitely check out their online store, their items are very trendy and I can tell you : it is hard not to fall in love with almost all of their pieces. I also got from them the white faux-fur vest that you may have seen at the end of my make-up video, a real must-have for the winter season. I paired this neon sweater, to some more neutral pieces such as those black leggins I received during my trip in Tokyo, a gray faux-fur vest and also another gift : a jewel clutch. Thanks to www.wanderlustandco.com, they do know that diamonds are a girl’s best friends! You will be able to see next week some other pieces I got from them. So I wanted to share with you my sick-week’s discoveries : I have become a real movie critic ( I mean when you have to stay in bed most of the time you’ve got only a small range of activities to do : either you do your nails, talk on the phone, blog, or watch movies, either you sleep. Once you’ve done your nails five times, spoken to most of your contact list and done an indoor ”four outfits for four winter parties” post, you have got nothing left than sleep or watch movies. I had enough of sleeping so I started a huge movie session). Since winter has moved in most of the countries ( california people, I hate you ), I think some of you will enjoy some time at home, and nothing is better than a tea latte and some greats films when it is snowing outside. Here are some great movies you should definitely check out. The first one is Woody Allen’s Match Point. I decided to watch it at first because I am huge fan of Scarlett. The story line is incredible, it shows that so many things are finally out of our control and depend on one simple thing : luck. The main character is tortured between two relationships, one made of wealth and respec, the other of passion and physical attraction. If you guys are fans of W.A you should see this movie, I have seen a lot of his work and this one is, for my taste, the best. Another movie to see is La Môme with Marion Cotillard. This is a biographical movie showing the life of the famous 20th centurie’s french singer Edith Piaf. Watch it just for the incredible talent of Marion to play such a difficult role, this is so worth it. Absolutely love the neon sweater!! You look gorgeous! Love the edgy feel! That sweater is perfect. 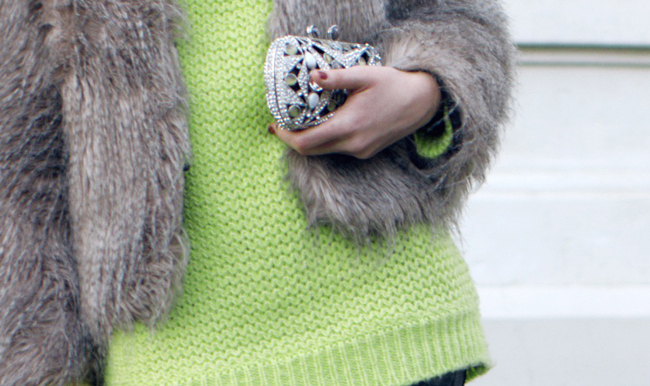 The fluorescent sweater paired with the faux fur is such an ultra chic look! Match point is an amazing movie, I find it strange that you hadn't seen it so far. I think the movie with Edith Piaf is "la vie en rose". Perfect way of combining neon! Love the outfit. Your sweater is totally amazing! Love neon colors! Love the bright bold of neon in the dead of winter!! Such a standout piece styled in the most effortless way...chic honey!! Woody twist...Marion makes another cameo in this feature...you'll love it! How can you be so gorgeous?? :) Love the colour of the sweater, now I'll check out this online shop! However, I've been sick like you and fortunately today I went out ( to university -.- ) after a week at home...! So, I can understand you! Love everything about this outfit! Especially how you can't tell where your pants end and your shoes begin. You're feeling better, you're looking gorgeous! I loved la mome with Marion cotillard! She's such an amazing actress and really shined in that role!!! Your neon sweater is so chic! I'm looking for a sweater that color too! Hope you feel better soon! You've got a nice style, really love it ! This look is so edgy! omg! I just discovered your blog after cathinthecity.com linked you. I just want to say that it is amazing. You are so young and have such a good fashion sence. I bet you spend your days flipping editorials, cuz your photos, girl, are ah-mazing. I can easily see them in a magazine! I liked match point aswell ! Very cool sweater ! Love the neon sweater and you look lovely as always! It is a great contrast... and I love wearing bright colors when its cold oustide, just makes you feel a bit happier inside. Love the neon and your clutch! Glad to hear you feel better, I myself was sick all last weekend , great outfit! Love your sweater and your fur jacket. Get better soon! love the bold neon and the subtle print of your pants! SOOO BEAUTY! Destellas belleza Kristina!